In 1851 Sir Henry Fox Young (the governor of South Australia) was concerned that the young colony of South Australia was struggling. This was amplified with the gold rush in Victoria. He decided to use his influence as Governor to secure for South Australia a stake in the inland trade. The Governor set aside 4000 pounds as a bonus to be awarded to the first two boat owners to navigate the Murray from its mouth to the Darling junction in iron-clad steamers of not less than 40 horsepower and drawing not more than 61 cm of water when laden. Born in England, William Richard Randell, came to South Australia as a 13 year old boy with his family in October 1837, only ten months after the Colony of South Australia had been founded. Whilst helping his father, William gained a good knowledge of the lands around the lower end of the Murray River. Exposure to his father’s flour mill at Gumeracha in the Adelaide Hills, gave young William first-hand experience of the enormous power of steam; and formed the resolve that he would be the first man to put a steamboat on the river. For years William nursed his dream, and then in 1851 gold was discovered in New South Wales and the whole of the Australian society fell into turmoil. William Randell talked it over with his younger brothers and excited by the stories filtering through to Adelaide of the fortunes to be made by taking supplied to the goldfields, he decided that the time for action had come. William with the help of his brothers began building their steamboat in July 1852 even though none of them had ever seen a paddle steamer. The hull, 16 metres in length, was constructed from redgum timbers cut at Gumeracha and carted by bullock wagon across the hills to the construction site on the Murray River some miles north of the present town of Mannum. The boat was named Mary Ann after their mother, and was powered by ‘a fearsome wood-burning engine of 8 horsepower’ constructed by a German engineer in Adelaide. A remarkable feature of the contraption was the boiler which was externally rectangular with furnace through the middle. During the first test of the boiler, while waiting as the steam pressure built up and up, the tension was too much and they all fled over the side of the boat and ran into the bush to what they hoped would be a safe distance if the worst happened. And they waited. At last, instead of the mighty explosion they feared, they heard the steady beat of a piston. As the steam rose to it’s operating pressure the boiler expanded and bulged till it started to look something like a football. William Randell had bolts studded into it to try and strengthen the weak spots, and bullock chains were wrapped round it and tightened by hammering in wooden wedges. In this unlikely way Australia’s great paddle steamer era had begun. 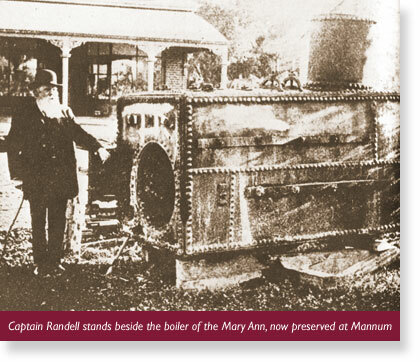 William Randell took the Mary Ann for a trial run on the Murray River on the 19 February 1853 and achieved his ambition 'to be the first man to put a steamboat on the river’. Twenty-one tons of cargo were then carted across the hills from Gumeracha for the first trading voyage which commenced on 25 March 1853. It was a drought year, and they were attempting their voyage in the middle of the low-water season. When they had gone 125 miles they had to give up the battle to cross half-exposed sand-bars, and turned back. They started again on 15 August, with a load of stores to sell to settlers along the river. The second steamboat captain on the river was Captain Francis Cadell. R.N. Cadell had spent many years at sea and had studied river navigation in the United States. Hearing of the prize offered by the South Australian Government he was determined to win it. He first sailed down the Murray from Swan Hill in a small boat to satisfy himself that the Murray would be navigable for a larger vessel. He then commissioned the construction in a Sydney shipyard of an 80 ton vessel, 32 metres in length beam and two engines each of 20 horsepower. At the same time he had constructed a barge at Goolwa, the Eureka, designed to carry 100 tons of cargo. When completed, the vessel was sailed around from Sydney and Cadell brought her in through the Murray mouth. Cadell had a natural flair for public relations. He named his vessel the Lady Augusta after the wife of the South Australian Governor, and on her maiden river voyage he invited a number of distinguished guests for the ride. These included the Governor and his wife, Sir Henry and Lady Augusta Young, a journalist (James Allen) whose written account ensured that the venture was given the greatest publicity, and members of the Legislative Council. 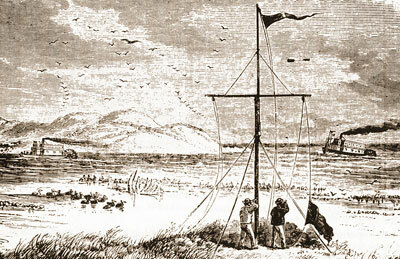 Cadell’s voyage commenced at Goolwa on 25 August 1853. Not far past the Murrumbidgee junction Lady Augusta passed Mary Ann. During the next few days the streamers travelled more or less neck-and-neck, first one in the lead, then the other. The Lady Augusta arrived in Swan Hill on 17 September, 23 days after leaving Goolwa, a few hours ahead of the Mary Ann. Both parties stayed there the next day, which was Sunday, and then set off again. The Mary Ann soon took the lead and led the way past what was to be Captain Cadell’s highest point on the voyage, Gannawarra. From there Randell went on to Maiden’s Punt, later to become Moama (the settlement across the river from the future port of Echuca). Randell had steamed no fewer than 1068 miles from Goolwa. Neither the Mary Ann nor the Lady Augusta met the conditions set down for the government bonus, but their owners were rewarded nevertheless. The two skippers each decided to set up riverboat operations. 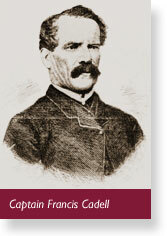 Cadell formed the River Murray Navigation Company and Randell secured backing for his Murray River Company. With those pioneering voyages, only seventeen years after the foundation of South Australia, a beginning had been made to steam-navigate the rivers of the Murray-Darling Basin. The way had also been opened for the rapid development of a great deal of the river areas. Stores could be carried rapidly from South Australian river ports, and even direct from Port Adelaide, without becoming dirty on the way or being damaged; freight-charges were lowered; pastoralists could be assured of getting their wool away, and of having it reach the markets more speedily than had been possible before.